Last week Sen. Elizabeth Warren, the Senate’s foremost advocate for lowering student debt and lowering the cost of college, received a petition signed by more than 240,000 people. The petition called on Congress and President Obama to cancel all student debt – all $1.2 trillion. It was delivered by representatives of 12 organizations that had collected the signatures across the U.S.: Roger Hickey, Campaign for America’s Future; Rachel Colyer, Daily Kos; Amanda Johnson, Working Families; Natalia Abrams, Student Debt Crisis; and John Hlinko, Left Action. They represented some of the 12 organizations that helped gather the 240,000 signatures. The petition calling for wiping out all student debt was launched in January in a blog post at the Campaign for America’s Future blog and on Huffington Post, written by Mary and Steven Swig, co-founders of the National Student Debt Jubilee Project, and Richard Eskow of CAF. Eleven other groups joined with the Campaign for America’s Future to send the petition out to their members: American Federation of Teachers, Courage Campaign, Daily Kos, Democracy for America, LeftAction, Project Springboard, RH Reality Check, RootsAction, Student Debt Crisis, The Nation, and Working Families. So last week’s delivery of 240,000 signatures was the culmination of a process that started early this year. And it represents only the beginning of a campaign whose momentum is building. 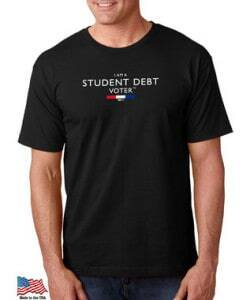 T-Shirts Deliver the Message: I AM A STUDENT DEBT VOTER. 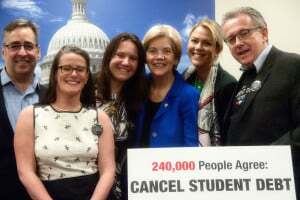 The coalition representatives also presented Sen. Warren with a t-shirt that declares I AM A STUDENT DEBT VOTER. The t-shirt, which we think more and more people will be wearing, makes it clear to politicians and friends and neighbors that student debt and the cost of college education is a top concern for the wearer. It implicitly asks candidates a question more and more candidates will hear in coming months: What will you pledge to do to lower the cost of higher education – and what will you do to lift the burden of student debt off the lives and careers of two generations of Americans, their families, and our economy? To purchase these American-made, union t-shirts, click here.